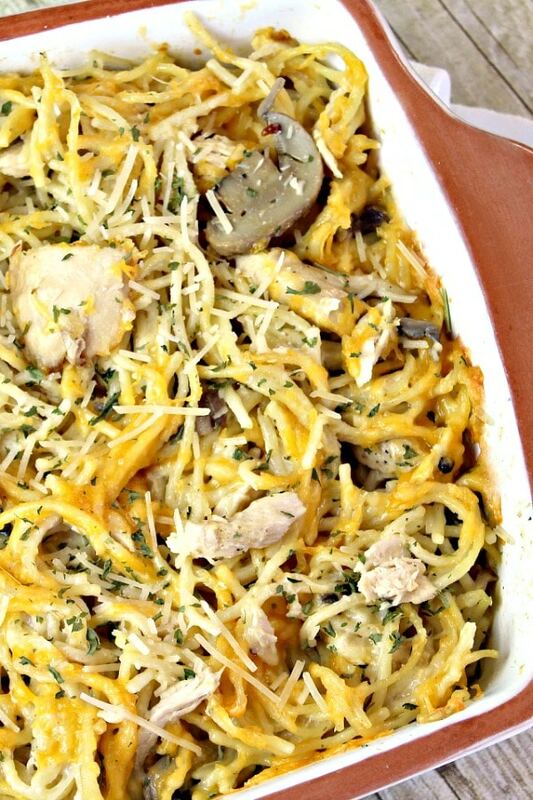 Chicken Tetrazzini has a fancy sounding Italian name. Really the name is the only fancy thing about this traditional pasta dish. It’s loaded with cheese, chicken and a delicious, creamy mushroom sauce. I promise once you try it you’ll make it all the time. For a long time I avoided making Chicken Tetrazzini because I thought it would be complicated to make. I couldn’t have been more wrong about that. Turns out that this is a simple dinner that you can enjoy with your family anytime but it’s defiantly company worthy. This recipe does required cooked chicken. If you want to save time you could use a prepared rotisserie chicken or frozen cooked chicken breasts from the freezer section. Chicken Tetrazzini is not an Italian recipe. It is actually an American dish. It’s thought that Chicken Tetrazzini was created first at the Palace Hotel in San Fransisco and named after opera singer Luisa Tetrazzini who was a long-term resident of the hotel. Can Chicken Tetrazzini be frozen? Yes! 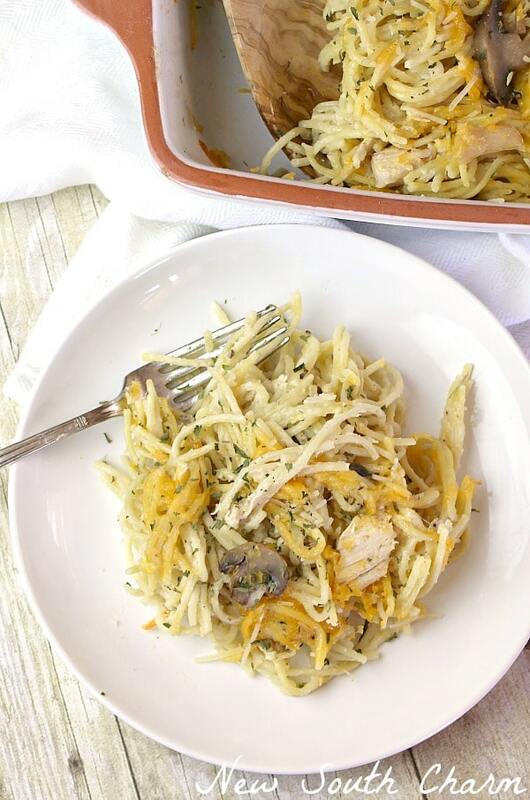 Chicken Tetrazzini is perfect for making ahead and freezing for another day. I recommend two steps to ensure you get the best favor from your frozen dish. First, do not add shredded cheese to the top of the casserole. Shredded cheese can become dry when frozen which will prevent it from melting completely. Secondly, do not bake the casserole before freezing. To make the freezer friendly follow steps 1-4 of the recipe. Next, cover the pan tightly in plastic wrap then in foil. And place in the freezer for up to three months. 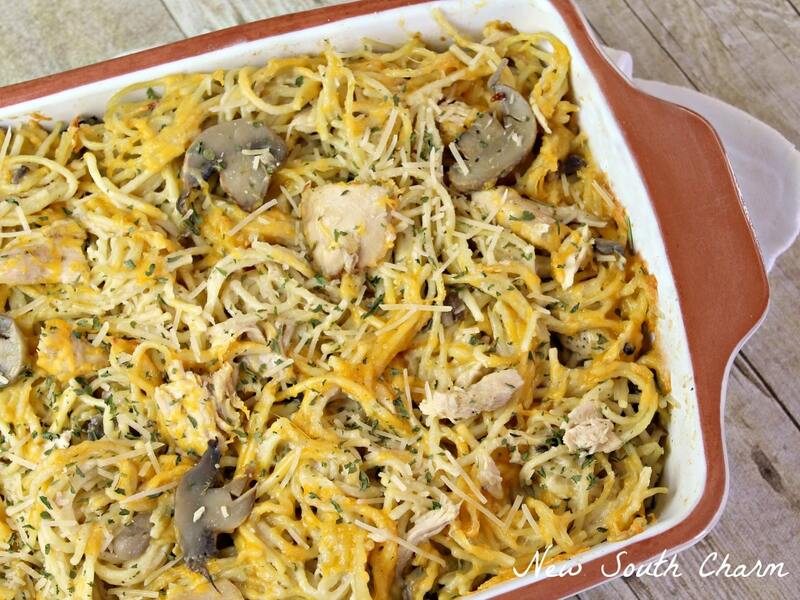 Want to make one dish of Chicken Tetrazzini to eat tonight and another to freeze for later? Just double the ingredients and divide into two 9×13 then follow the steps for each. Once you’ve made the chicken or while the chicken is cooking put cook the pasta according to package directions. When pasta is done cooking return to pot and set aside. To make the mushroom sauce you begin by melting butter over medium heat in the bottom of a sauce pan. When the butter is melted add flour. Stir butter and flour together and continue stirring for one minute. Add broth, cream of mushroom soup, mushrooms, celery salt, salt and pepper. Cook mixture until slightly thickened. This is was about 8 minutes for me. Pour mushroom sauce and chicken into the pot with pasta and stir to combine. Transfer into a 9×13 dish treated with nonstick spray. Sprinkle parmesan and cheddar cheese over the top and Bake at 350º for 30 minutes. I like to serve this with a salad and a big loaf of crusty bread. Just writing about this recipe has made me hungry. Good thing there’s leftovers in the fridge! Looking for more great chicken and pasta dishes you’ll love these! This wonderful recipe is loaded with cheese, chicken and a delicious, creamy mushroom sauce. Prepare chicken using method of choice. Wow, this looks delish and so easy! Thanks for sharing at You Link It, We Make It – hope to see you back tomorrow! I’m Pinning this! 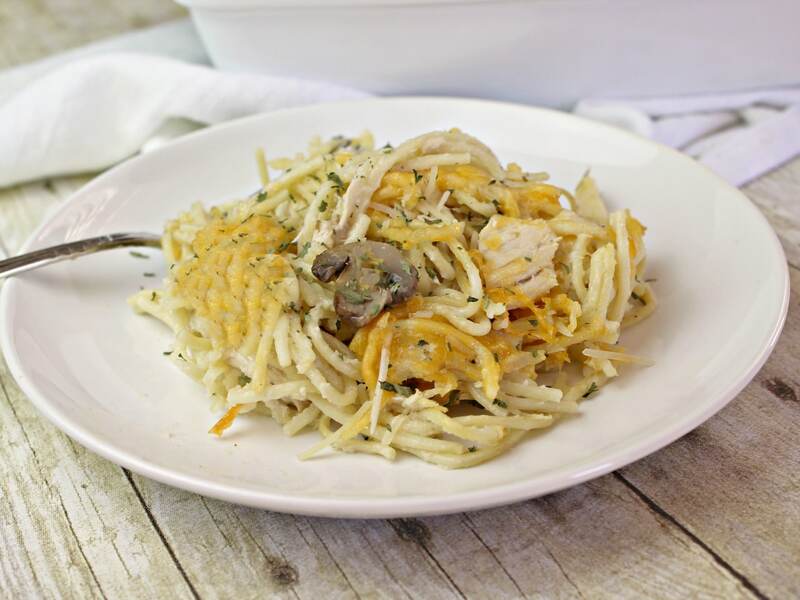 Your Chicken Tetrazzini looks amazing! Thanks so much for sharing your post with Full Plate Thursday and have a great day! Nice and easy. Thank you and have a good week. Oh wow, this looks so good. 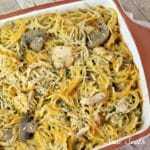 I love tetrazzini, and I know my family will too. Noodles and cheese with your creamy sauce! Mmmmm.